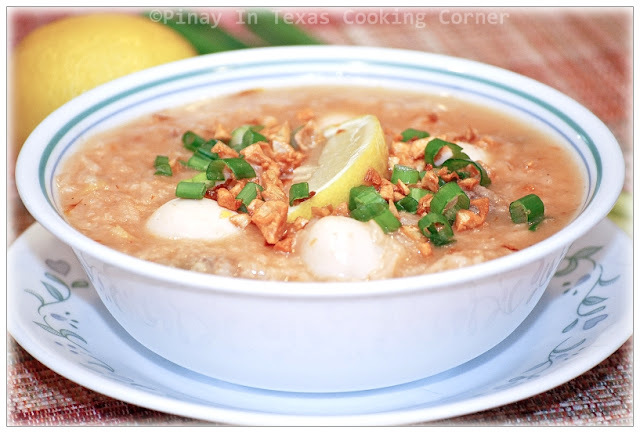 Arroz Caldo which literally means "rice soup" is a favorite comfort food among many Filipinos. Despite its Spanish name, this dish is actually an adaptation of the Chinese congee or porridge. It is flavored with chicken, garlic, ginger, and safflower (kasubha). The latter is our local saffron which gives arroz caldo an appealing aroma, not to mention the bright yellow tinge. Arroz Caldo, which best represents the mixture of Filipino heritage combining Spanish, Chinese and Filipino flavors is perfect for someone having a bad cold. It's also great during rainy weather. It is one dish that you can eat any time of the day. We, Filipinos eat it for breakfast, lunch, dinner and even merienda (snack). 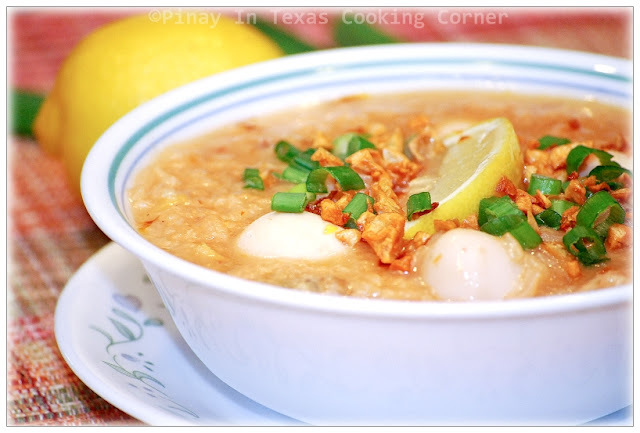 A hot bowl of arroz caldo with a squeeze of calamansi or lemon is my family's favorite during winter season here in Texas. It can truly give us warmth and comfort. Try it! 1. In a large saucepan over medium heat, saute garlic in olive oil until light brown. Add ginger and onion, and sauté for a minute. 2. Add chicken cube and stir until it melts. Add chicken and sauté until both sides turn light brown. 3. Add rice, water and fish sauce. Mix well. Cover and simmer in medium heat while stirring occasionally for about 40 minutes or until rice is fully cooked . 4. Add the eggs then add the safflower and half of the sliced green onions. Add salt and pepper to suit your taste.If soup becomes too thick, add a little water to thin it a bit. 5. Remove from heat and transfer to individual bowls. Garnish each bowl with chopped green onions and fried garlic just before serving. Sprinkle with lemon. Very tasty looking! Nicely done! i've always wondered about those canned quail eggs .. so they're good enough? i once made 48 spicy pickled quail eggs - 2 jars that i treasured more because of the hassle .. will give the canned ones a try .. thank you, tina! Hi! 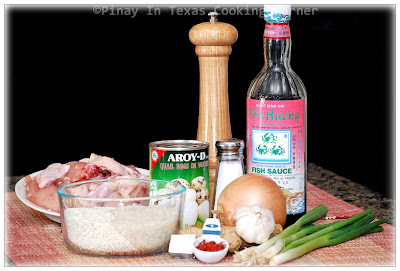 May I borrow the picture of the rice porridge for our Filipino Project? Thank you very much!